There has been a bridge theme occupying my mind for many months. 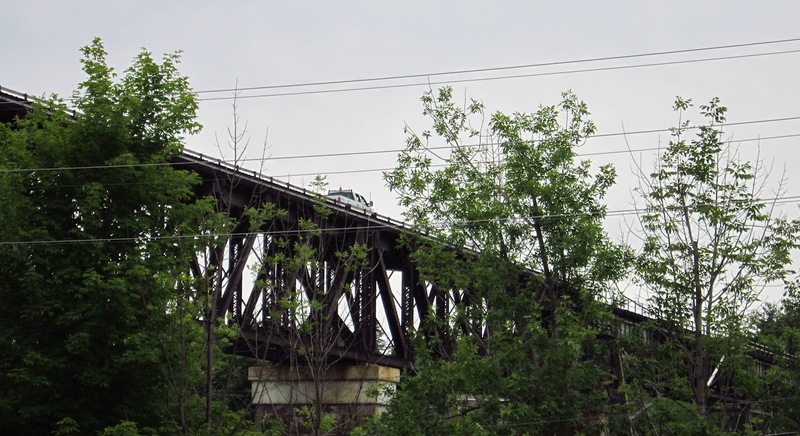 A few weeks ago, we Canadians were surprised to hear of structural damage to a bridge in Northern Ontario that joined the east to the west. People were concerned that our vast, beautiful country seemed split in half if only for a couple of days. This weekend, one of the artistic young adults and I visited Monet, A Bridge to Modernity an exhibit at the National Gallery. It was beautiful and inspirational. I was glad to have splurged the extra $6 for the audio tour. I also spent a little more money to bring some of the exhibit back to le petit apartment. 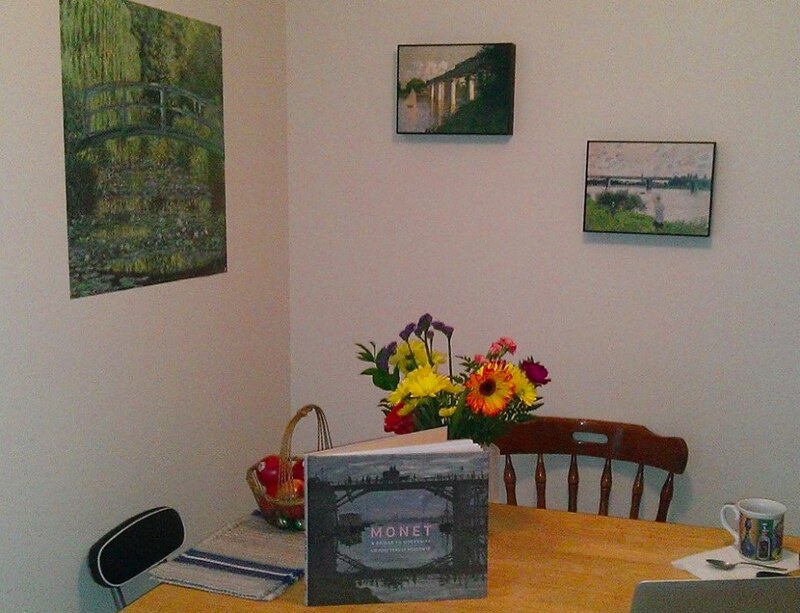 The prints and poster were an appropriate addition to the bare walls in the new dining corner setup. They dissolve the winter blues, fitting the recommended Feng Shui arrangement and colour pallet to welcome the Lunar New Year, the Year of the Monkey. 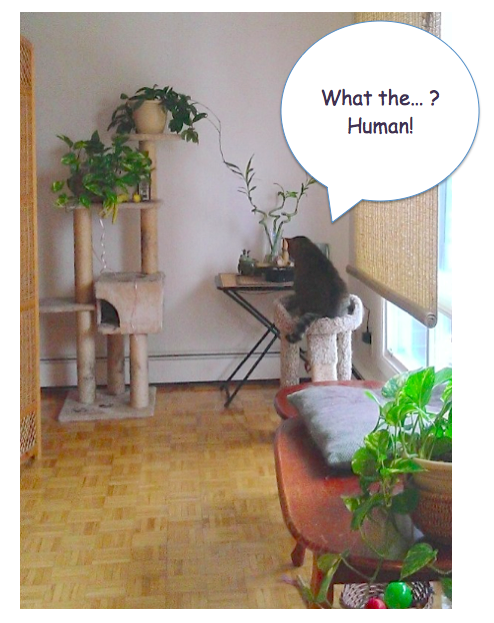 The felines are still getting used to some of the recent changes. The Monet experience makes me want to try my hand at water colour painting again and in the impressionist style “en plain air“. Maybe when the weather is more agreeable, yes? Perhaps during the summer, along a river bank. I grew up near a river that fed into the refreshing Georgian Bay. There were many different bridges that crossed the Seguin River. 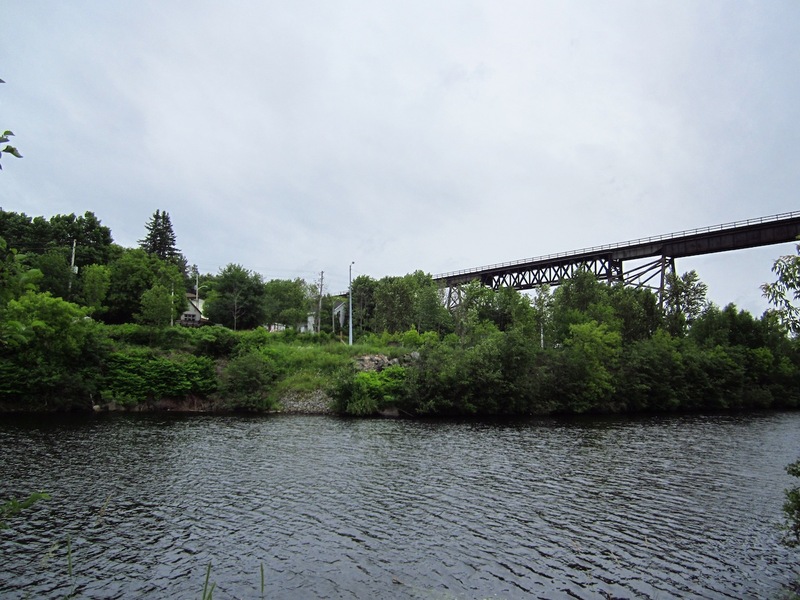 One was the Canadian Pacific Rail (CPR) bridge that rose above our neighbourhood, spanning the river to the richer side of town. It also marked the division of our side bordering on the Townies from that of the Harbour Bums. During a journey to the home town last summer, I got to revisit the bridge’s domain and witness much rebuilding activity along the rails. These experiences reinforced the theme of building, capturing the beauty of and repairing bridges in the corporeal world. We can also explore bridges between the past and the present. It can be exciting and emotionally draining when you have reached back to the murky past, bravely transit the present and reach into the fogginess of the future. Some bridges are worth the risk and energy to cross. Some bridges (relationships, experiences, etc.) are not worth the toll on one’s health, psyche and sense of self-worth. When you encounter those that seem cracked and unsupportive, you can choose a different route or tread lightly and keep a safety net handy. Thanks for dropping by. May all of your bridges be sturdy, lead you to auspicious experiences and destinations. May they join and not divide.